It’s 3 a.m., and you’re in the midst of pulling an all-nighter, finishing an essay for one course and studying for a final exam in another. Though students frequently stay up until the early morning hours studying for finals — or perhaps don’t sleep at all — food options near campus at 1 or 2 a.m. are scarce. Students at Ohio University have the Union Street Diner in Athens, Ohio — open 24 hours. Students at Penn State have a Denny’s in State College, Pennsylvania — open 24 hours. Oakland has no 24-hour options. And the places that do exist — like Pamela’s Diner — close relatively early for the late-night schedule many college students live by. Why? The answer, according to multiple restaurant owners in the area, is that late-night hours bring crowds from the bars, and most owners aren’t interested in dealing with inebriated college students and the security issues that would entail. The concerns about safety and security aren’t unfounded. 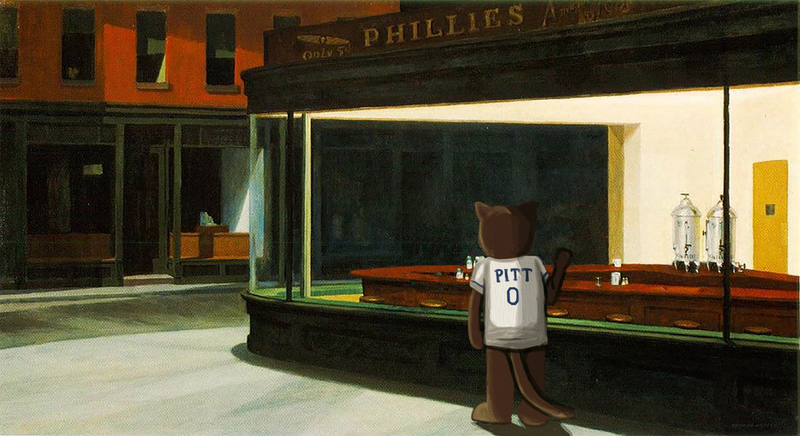 Current Pitt students may not know that Original’s Hot Dog Shop, also known as “The O,” used to stay open until 5 a.m. and was a hot spot for late night crowds. An article titled “All About the O” ran in The Pittsburgh Post-Gazette in 2009 and described the restaurant as “bustling” with inebriated crowds even at 2 a.m. In addition to the drunken restaurant-goers, Pittsburgh police were a regular fixture to prevent patrons from getting out of hand. Recurring violence in the early hours of the morning culminated in a fatal shooting outside the O in October 2005 and another on Forbes Avenue in August 2013. While representatives from the O declined to comment on why the beloved late-night favorite is now open until 1:30 a.m. at the latest. Brandon Smith is the co-owner of Fuel and Fuddle, whose restaurant sees a portion of the late-night, rowdy crowd. The restaurant’s kitchen is open until 1 a.m. and the bar until 2 a.m., when it offers half-priced food deals. Smith said he often gets comments from people — particularly those leaving nearby bars like Hemingway’s Cafe after 2 a.m. — wondering why Fuel and Fuddle doesn’t stay open later. He admitted there have been conversations about extending the restaurant’s hours, but ultimately, he’s leaning against it. John Ritter — co-owner of Ritter’s in Bloomfield, which is open 24 hours Wednesday through Saturday — is also wary about security. Ritter said 1 to 2 a.m. closing times is probably going to continue as the norm around Pittsburgh. “Late at night, you get a lot of riff-raff. People get in fights, and things get damaged. It can be a headache,” Ritter said. In addition to safety concerns, however, some owners said it’s too expensive for them to stay open late. Michelle Mazzella, the co-owner of Pamela’s, says that even the popular Forbes Avenue diner would have trouble justifying the cost of extended their hours late into the night. But maybe the situation is different in Oakland — where the demographics differ from other non-college dominated neighborhoods. Ritter’s owners haven’t considered branching outside their Bloomfield location. It’s a “mom-and-pop kind of place,” Ritter said over the phone, but he acknowledged that the 24-hour model could work in Oakland. Pamela’s location in Oakland did have a brief stint as a 24-hour diner “about 10 years ago,” according to Mazzella. However, it switched back to its current 8 a.m. to 4 p.m. schedule after a month due to a lack of traffic. Pat Kelly, the manager of The Porch, also questions the cost of keeping the restaurant open past its current closing time of 11 p.m. The Porch is owned by Eat’n Park Hospitality Group, a restaurant division that also owns the 24-hour Eat’n Park diners located around the city and Hello Bistro. “The hours are based around the sales flow of traffic coming into the city,” Kelly said. At the end of The Porch’s first year in 2011, they noticed that after 9 p.m., the restaurant became “a ghost town,” and business slowed down significantly. A late night, half-priced pizza special — introduced later in 2011 — still provides the restaurant with a steady stream of night time customers today, especially during finals week, but Kelly still doesn’t believe it’s feasible to stay open later than 11 p.m.
“For the amount of money you’d have to bring in just to break even, it’s just very difficult,” Kelly said. Allison Harnden is Pittsburgh’s new night time economy coordinator and recently worked with Mayor Bill Peduto to create initiatives for a safer, more vibrant nightlife in the South Side. Harnden supports the idea of a 24-hour diner in Oakland and is optimistic about its potential but said the challenge is in changing attitudes.